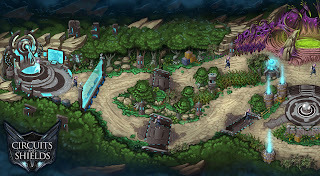 Recently the folks working on Circuits and Shields hired me to do a concept of the map for there up and coming MOBA. It was a lot of fun to discuss and work on a overall vision for the project. 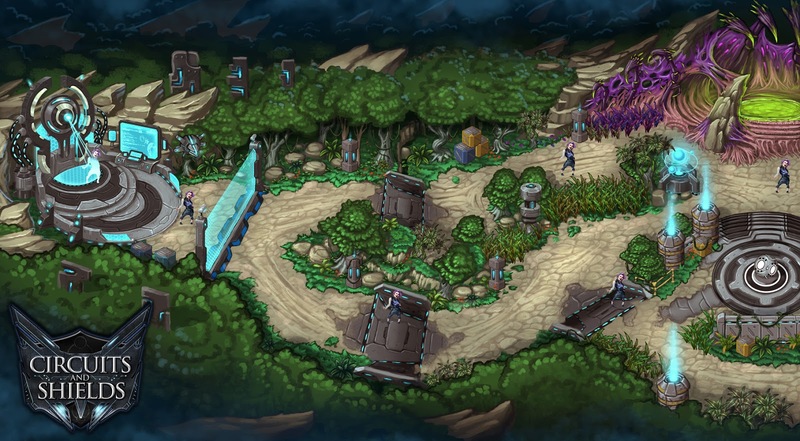 Previous work on MOBA's has had me doing environment designs based upon each zone. Creep zone, spawn, towers, so on so forth. But they needed to try and grab a overall general feel for this map. Having to concept a entire section of the map that could be mirrored had its challenges. In the end we got to a good place. With the combination of the other concepts that were done. They have a good forward momentum now on designing the map! Check out the site which should be fully live in the near future. Yet still has various media content and other information about the work in progress. Also look forward to helping them kickstart the project if your a MOBA fan!